Chef Sam Crannell heads to Seattle's boomtown neighborhood South Park, and his pizza is really, really good. In case you’ve somehow missed it, South Park is changing as Seattle booms, and fast. Condos are going up, and selling at prices unthinkable until now. 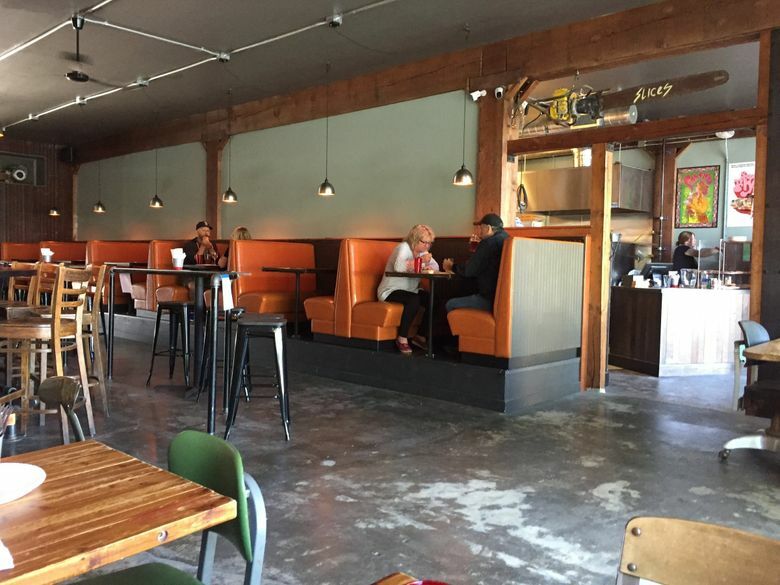 Twin signifiers of gentrification are in place: a nanobrewery/taproom (Seattle-Lite Brewing Company, replacing Burdick Brewery, itself just a year old) and a wine bar (Left Bank opened last fall, billing itself as South Park’s oldest wine bar). The neighborhood was surprised to learn last year that longtime favorite Loretta’s serves the fourth-best hamburger in the entire U.S.A. (according to Thrillist) — and now it has brand-new neighbors, including bar-and-sandwich-place Uncle Eddie’s, a cafe going in around the corner, and South Town Pie. But if change must come, let it at least bring very good pizza at a fair price — and this is South Town Pie. It’s the new enterprise from Sam Crannell, who ran Queen Anne’s LloydMartin until the end of last year. Upon shutting that beloved restaurant down, Crannell noted that when it comes to dining and spending, “Seattle has changed the rules of the game while we are all playing.” With costs rising and rising, he had watched his profits “all but disappear.” Pizza in South Park was his lower overhead, lower price-point future, and that future is now. The slices: Call South Town’s crust New York-ish style — thin and flexible and usually foldable — though on one visit, the edges of some slices ($3.75 each) were much more crusty than others. Crannell says it just depends on who’s making the pies, but they’ll probably get these vagaries ironed out; the place is still brand-new. The tomato sauce tastes just-right fresh and bright, the mozzarella blend is clearly high-quality, and toppings are delicious across the board. If you see a slice with the house-made sausage, get it: It’s fennel-y and nicely spicy, and Crannell should set up a side business selling it. Pepperoni comes from Zoe’s, and veggies are treated with all due respect — asparagus still crunchy and glowing green. 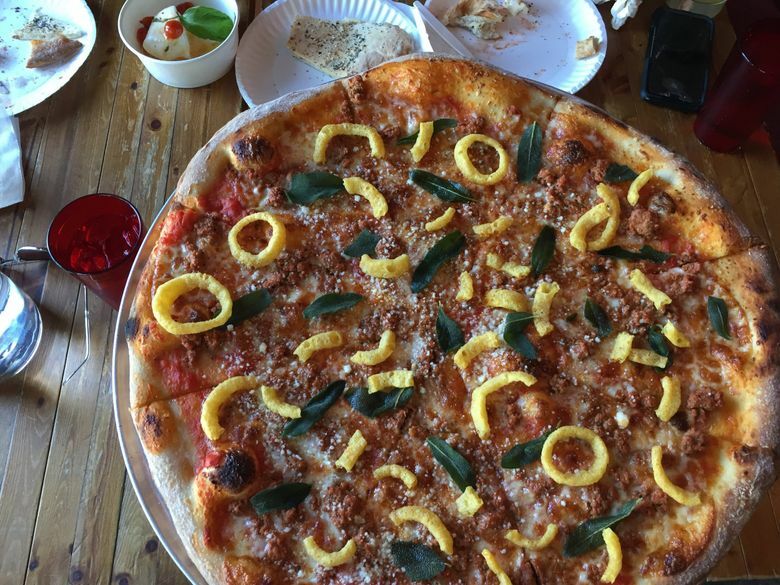 The pizza with the Funyuns: South Town Pie’s Instagram hit will be the wild-boar ragu pizza with — yes — Funyuns. The styrofoamy, onion-powder-flavor rings are strewn all across the pie, as are crispy-fried whole sage leaves for contrasting color. It’s a great-looking gimmick and one that absolutely works: The tender, meaty, rich ragu plays off the dusty-herbiness of the sage, with the Funyuns adding crunch and little extra hits of MSG. Important note: Whole pies here go for around $20 to $25. They are big. Bring a couple friends (or just one Tan Vinh — he can really put it away) and get one. They don’t sell the Funyun or the pastrami pizza by the slice. 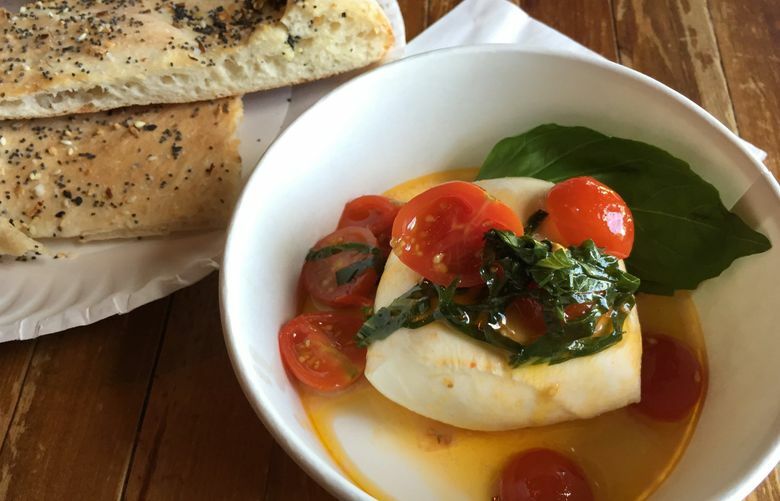 And don’t miss: South Town’s fresh mozzarella is a big, lovely blob of the stuff dressed with sweet cherry tomatoes, whole basil leaves, and lip-tingling olive oil that’s orange with chile-magic, and it comes with urfa-biber-spiced flatbread ($9).